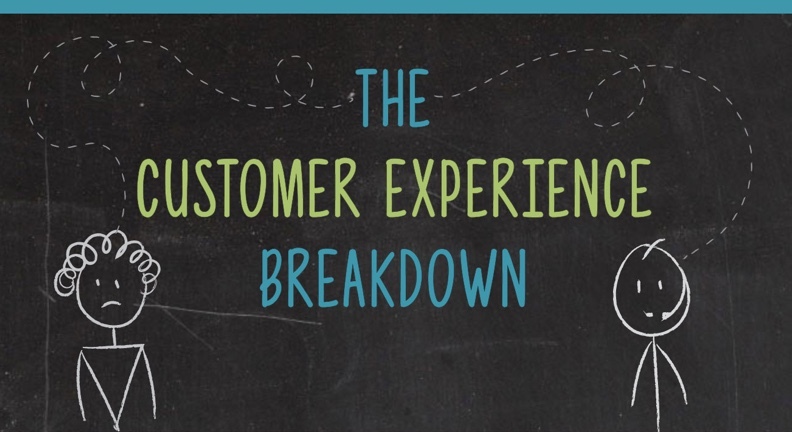 We’ve all been victims of the customer experience breakdown. Whether it’s while shopping at a store, eating at a restaurant or going to the bank, the sinking feeling when you receive lower quality customer service than you expect is unmistakable. Most of the time, customers take similar actions after a negative experience. Customers grumble about the poor service to their family, friends and co-workers, and resolve to avoid the brand in the future. What’s odd about customers’ reactions to a negative experience is that only 4% of dissatisfied customers inform the organization about the poor service. This disconnect between organizations and customers who received poor experiences too often results in organizations delivering the same broken experience over and over because they’re unaware of their unhappy customers. To demonstrate how organizations may be unwittingly delivering poor customer service, we created an infographic to show The Customer Experience Breakdown. Customer experience breakdowns can occur at any customer touch points. Many of these touch points involve direct human interactions. But customer experience breakdowns aren’t just the fault of the employee who delivers poor service; they’re the result of a whole organization failing to keep its brand promise. The first step in any organization’s relationship with its customers is its brand promise. This promise, which manifests as a set of expectations in a customer’s mind, is conveyed through marketing messages. These days, messages are sent to customers in a variety of remarkable ways. Whether it’s mobile marketing, email, social media or good old fashioned billboards and TV commercials, customers are often full of excitement after receiving marketing messages from a brand that interests them. Customers then form expectations about the organization they are planning to engage with and the products and services they may potentially purchase. By failing to equip employees with an understanding of the brand and how to live it, organizations, not individual employees, are responsible for the origin of the customer experience breakdown. Another key factor in customer experience breakdowns is that employees who don’t have direct contact with customers view themselves as having no role in the delivery of the brand promise. For example, it’s usually a non-customer facing employee who writes the return policy for a large retail store. This return policy will affect customers, so this employee very much has an impact on the delivery of the organization’s brand promise and customer experience. But if this employee fails to consider the point of human interaction – both from the perspective of their fellow employee and the customer – they will have completely ignored their role in the customer experience. Every action of every employee has an impact on a customer’s experience, but it’s up to organizations to not only foster this idea within the hearts and minds of its people, but also ensure they are enabled and empowered to deliver it. Consistently delivering great customer experiences – ones that align with and keep the brand promise conveyed by your marketing messages – is not easy. The are many areas of an organization where mistakes can be made, and any gaps can create a poor customer experience and a broken brand promise. The good news is that putting in the time and effort required to develop a plan to fix the gaps that may be causing customer experience breakdowns is absolutely worth it. 82% of people will not do business with you after an unresolved poor experience. Given the nature of today’s hyper competitive business world, organizations – and their bottom lines – have much to gain from identifying and resolving the gaps so they can consistently keep their brand promise and deliver a great customer experience. That’s all we’ve got for now, but here’s the full Customer Experience Breakdown infographic in case you want to share or blog about it!